ACA regulations require Applicable Large Employers to issue eligible employees an IRS 1095-C form. This form may be new for some employees so you may want to ensure they are well informed of what to expect. What is an IRS Form 1095-C? The IRS Form 1095-C provides you with information about the health coverage offered by your employer. You may receive a form even you decline coverage. 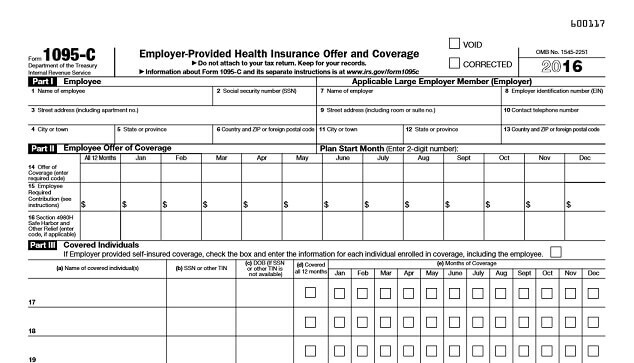 This form provides information about your coverage such as the number of months you and your dependents (if applicable) were covered. It will also show the cost of the lowest monthly premium plan offered to you. Continue reading What is an IRS Form 1095-C? Posted on October 24, 2016 October 25, 2016 Categories ACA PreparationTags 1095-C, ACA, Affordable Care ActLeave a comment on What is an IRS Form 1095-C?